I have been accused on occasion of being a data geek. This post should help substantiate that accusation! For those who tracked my goshawk research last year, you may remember that the late spring snows caused significant difficulties in our field work. So much so that this year I am proposing to start the field season one week later and have even considered starting two weeks later! Then the very dry winter hit. The snow pack in my study area was less than half of normal. This caused concern on the other end of the spectrum - should I start the season earlier? There is not much I can do about it yet, but that didn't stop me from keeping a close eye on the numbers. As many have heard, and others have witnessed directly, there have been some pretty impressive storms in the northwest. The graph below illustrates the 2011 snow pack, which was near normal, and this year's snow pack. Check out the impact of those recent storms! January snow in not a strong predictor of snow pack in May, so I will just have to wait. Regardless, I will continue to keep a close eye on the matter. First painting completed today - Two California Condors. There were quite a few more families that came through today than last September. In addition, the average age of our guest artists was significantly lower than last fall. Regardless, they were very successful in completing a new painting today and completing one that was just started last time. The work is spectacular considering the average age of the guest artists was significantly less than ten years old. First paint on the canvas! As with the last time we did this, Karyn had sketched the design onto a blank canvas. Actually, this was one she had prepared for last September, that we didn't quite get to. We were busy right from the start. Just minutes after opening, while we were still trying to get set up, paint was flying on the canvas. The event was a family day and had been promoted broadly. A local radio station was onsite as were food vendors. The admission was free as well. Anyway, the crowds didn't let up all day long. We had a photograph that the painting was based on and Karyn had painted a small rendition herself to help the young artists extrapolate from a highly detailed picture down to a handful of paint colors. My job was to replace the water in the trays, clean the brushes, provide crowd management, and occasionally provide some basic painting tasks to the artists. Some parents left the management up to us, while others jumped in to lend a hand or offer encouragement. The detail is starting to show! With the first painting complete, we returned to the second painting that was started back in September but not finished. This painting was of two Rüppell's Vultures from Kenya. Great progress on painting #2! It was a big day and both Karyn and I are exhausted. However, the investment was well worth the effort. Exposing this many families to the world of wild birds is outstanding. Watching young people take a true interest in raptors is priceless. This should definitely help with the mission of the Peregrine Fund. We are happy that in our own small way we can contribute to their very successful programs of conservation. The completed paintings are on display at the Peregrine Fund's World Center for Birds of Prey. I guess it has been over a month since I have provided an update on my Goshawk research. That doesn't mean that progress isn't being made. In fact, quite the contrary is true. For those new here, I study breeding season diet and prey abundance influences on the Northern Goshawk in a small isolated forest in southern Idaho. By choosing this filter, you will see all of my previous posts on the first year of my study (stories, photos, videos, etc.). I am now preparing for my second field season this coming May. In December I finished and submitted my annual report to the Forest Service. This was a major accomplishment and its great to have that behind me. As I mentioned in my previous post I have been studying Hierarchical Bayesian Statistics on my own to rework my analysis to account for detection probabilities and to deal with underlying variance in my prey abundance estimates. This has been a hard path to take. After trying to force my way through it, I have decided to step back and work through a textbook end-to-end including all of the exercises. This is intended to increase my overall confidence in the method and ensure I can adequately explain it in my thesis. The textbook I have chosen is Doing Bayesian Data Analysis: A Tutorial with R and BUGS. Don't the puppies on the cover make it look easy!?! I am now on chapter five and I can honestly saw that this is an excellent book. Even though I have a math degree, it has indeed been over 24 years since I have used calculus. This book is written in relatively easy to understand english with just the right amount of math mixed in. While working on that exercise, I have continued to apply the concepts to my data analysis. I have made significant progress on this front, however I won't know how correct my analysis is until later. Regardless, I have decided to explain what I have done and what the PRELIMINARY results look like. This will provide a basis for asking the experts to take a look over my work and provide me feedback. I summarized the first step of this Bayesian re-analysis in a previous post. Essentially the first step was to perform the same analysis which I previously completed using Logistic Regression, but this time using Bayesian approaches. I was successful in accomplishing this task. The results continued to show that avian prey abundance and mammalian prey abundance were important predictors of nest occupancy, but only avian abundance was significant. However, the model including both avian and mammalian prey abundance still fit the data better than the model with only avian prey abundance included. This is why I can say that mammalian abundance was important even though it was not significant. So the next major step in the analysis, and one of the reasons I am shifting to Bayesian statistics is to include detection probabilities to deal with the issue of false negatives. Essentially the analysis up to this point has assumed that if I found a goshawk on a nest then that territory was occupied - safe assumption - but if I did not find a goshawk then the site was not occupied - a very unsafe assumption. By integrating the probability of detecting an occupied nest into the analysis, I am essentially allowing each of those "unoccupied" territories to instead be "possibly occupied, but not detected". The really cool part is that you can actually do this, through some really fancy calculus. The inclusion of detection probability can have a dramatic impact on the results. It has been shown to have a huge impact on abundance measurements, but my study is not looking into abundance. However, it is still applicable to my study and could strengthen or dilute the effect of predictor variables such as avian or mammalian prey abundance. Detection probability is usually determined from intrinsic factors in the data. Ideally surveys would be repeated up to three times. These repeat visits provide a basis for the imperfect detection when the animal is detected on one visit, but not another. However, repeat visits are very expensive. Last season we had over 450 survey points. We lacked the time or money to perform repeat visits. My approach to address this took two steps. First, there were two nests where we had broadcast a goshawk alarm call within 200m of the nest and did not receive a response. We later discovered the nest. In these cases I have counted the first visit as no detection and the second visit as a detection. I set all other second visits to NA (no second visit performed). Here is a sample of what the observation table might look like. The Bayesian approach is robust to unbalanced sampling designs such as this. In addition to this minimal data from my surveys, my Bayesian models specify "prior" knowledge of detection probabilities. One of the strengths and one of the criticisms of the Bayesian approach is that you can include "prior" knowledge that influences the results. Those who use frequentist statistics often use this argument against Bayesian results. However, the frequentist approach does have "prior" knowledge built into the assumptions which in most ecological studies, are not fully met! I know of three other goshawks studies using the same search protocol that I used (it's a Forest Service standard). These studies have found the detection probabilities to be 0.54, 0.75, and 0.90 for single visit surveys. I included in my model the "prior" knowledge that the detection probability was uniformly distributed between 0.5 and 0.9. In other words, it has an equal chance of being any value between 0.5 and 0.9. With this "prior" knowledge and my limited repeat visit datapoints, I should get a new estimate of the detection probability for my study and an estimate of what we actually missed. First, it is time to perform model selection. Running all of the models that I previously used in Logistics Regression, but this time in a Bayesian analysis, the top rated model was the model including avian prey abundance but not mammalian prey abundance or the percent of the territory which is forested. So, detection probability did have an impact on model selection! 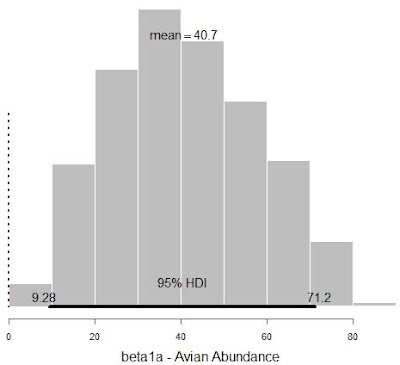 Looking into the model results, avian prey abundance remained a significant predictor of nest occupancy (Figure 1). 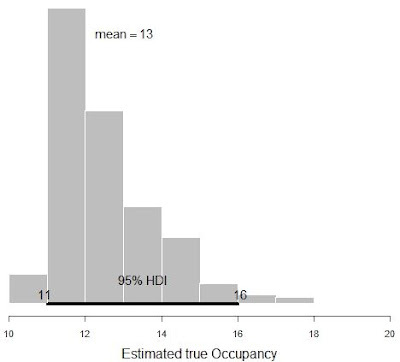 Significance is indicated by the 95% High Density Interval (HDI) not overlapping zero. The High Density Interval is roughly analogous to the frequentist 95% confidence interval. Figure 1: Posterior distribution of model coefficient for avian prey abundance. 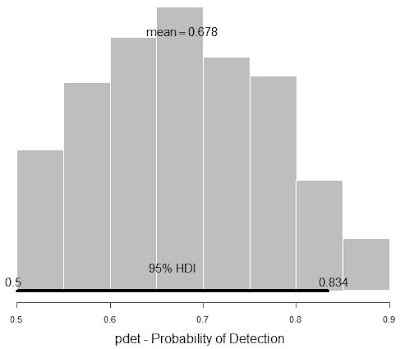 The combination of the "prior" for probability detection and my data produce a posterior estimate for the probability of detection for my survey of 67.8% (Figure 2). Figure 2: Posterior distribution for Probability of Detection. The real unique result comes from the estimate of how many occupied nests there really were. The sampling approach used to solve these problems essentially produced 50,000 estimates of all of the possible values, each constrained by the model and the priors. The result is a distribution of those estimates which provide a credible probability of the true value given the priors and the data. Figure 3 illustrates the estimated number of occupied territories out of the original set of 24 historical goshawk territories. Hence there is a 95% chance that there were 11 to 16 occupied territories out of 24. The expected value is 12 nests (mode) or 13 nests (mean). The "observed" value, those that we actually found, was 10. The model predicts that we most likely missed three occupied territories. Had you asked me prior to this analysis, I would have guessed that we missed two. I am not surprised that it could be as high as six. Figure 3: Posterior distribution of estimated occupied nests within 24 historical territories. Now it's back to the textbook to improve my comprehension and confidence with all that I have explained here. The next step with this analysis will be to integrate the uncertainty of my prey abundance estimates into this model. Writing this post has helped me clarify which concepts I fully grasp and which still need some work. If you are still reading, thanks for sticking around, I appreciate it. Be sure to let me know if you have any feedback. While not as rare as a dark-morph Northern Harrier, I have seen a number of rare birds so far this year. The birds may not be rare for the area in general, but are rare this time of year. The result is that ebird, the bird logging system used across the country, flags the entry as unusual. As a user you have to confirm the observation with an extra step to help insure the entry was not an accident. For example, I have seen Loggerhead Shrikes on three occasions since January 1st (one was probably a duplicate). In each case I have to confirm with ebird that I truly saw a Loggerhead Shrike. Loggerhead Shrike, rare bird in Idaho for January. If the bird is considered very rare, then the local ebird monitor will put your entry on hold until additional documentation via a rare bird report is submitted and approved by a reviewing committee. This is all to help preserve the quality of the large ebird dataset. During the Bruneau Idaho Christmas Bird Count in early January, seven of the species on my list required extra confirmation and two required further documentation. Unfortunately for one of those observations, a Northern Mockingbird, I only had fleeting views. I was trusting two other people in my group that they had great views. While I was reasonably sure from my view it was a Northern Mockingbird, I was not solid enough to complete a rare bird report, explaining each of the field marks in detail. On Saturday Karyn and I returned to the scene of the crime. There, before us in the same tree, was the Northern Mockingbird. This time I will submit another ebird checklist, get flagged, and confidently submit the documentation AND photos. Northern Mockingbird in Idaho IN JANUARY! To the bird's credit, it is perched above a warm spring, which I sure tempers the cold weather. The following is a guest post I wrote for The Nemesis Bird. I am cross posting it here for those who do not read the Nemesis Bird, although you should! The Nemesis Bird is maintained by bird fanatics and researchers and is one of the top birding blogs on the net. Rough-legged Hawk. Snake River Birds of Prey NCA. Increasing the challenge of identification is the seasonal and regional differences in plumage within the same species. Plumage coloration is also related to the condition of the bird. In many songbirds for example, it has been shown that the coloration can be an honest signal of fitness. The greater the color richness and vibrancy of the adults within a species, the better the body condition, the stronger the immune system, and the higher the reproductive success. While raptors generally have more neutral coloration, there is evidence that the expression of certain pigments correlates with the strength of the immune system. Consider the expression of the color red in the tail of a Red-tailed Hawk or American Kestrel. This red color is believed to be directly correlated to immune system function. This connection is currently being investigated by another raptor biology student at Boise State University - Chris Porterfield. American Kestrel interacting with Red-tailed Hawk. Idaho. Bird identification can also be challenging when a species presents itself in different color-morphs. As a raptor biologist this is a central issue in my field. Most raptor species present different color morphs, sometimes as many as three or four. These color morphs are not to be considered sub-species unless individuals of a given color morph begin to assortatively mate - mate only with other individuals with that color morph - and they evolve away from the central population. Color morphs are controlled by genetic factors and thus their prevalence within a population is related to the reproductive success of the individuals carrying the morph. If the morph increases reproductive success then you would expect a greater percentage of individuals in the population to carry the morph or vice-versa. There is some evidence that color morphs have little influence on reproductive success, but the relative rarity of dark morphs leads me to believe otherwise. The morphs are produced by an increase or decrease in the gene expression of melanin - the dark pigment producing the color of most raptors. Dark-morphs are sometimes called melanistic birds. Dark-morph raptors are much more common in the old world than the new world and are more common in some species than others, but it is not understood why. Last week I was helping another graduate student with his field work. Neil Paprocki's project involves winter surveys of raptors within the Morley Nelson Snake River Birds of Prey National Conservation Are a (NCA). Last Monday Neil and I, along with another biologist Liz Urban, were surveying for raptors via a road survey south of Boise. The term "road" is very generous. This 4-wheel-drive path, mostly buried in Russian Thistle tumbleweeds, traverses the western portion of the NCA. We observed Red-tailed Hawks, Rough-legged Hawks, Golden Eagles, American Kestrels, Prairie Falcons, and Northern Harriers. Toward the end of the survey we flushed a bird just ten feet from the edge of the "road". "What was that?!?" First glimpse of the ghost! It's a harrier! No! Is it? What? Confusion took over as our brains shuffled the various field marks and signs we use for identification. We kept coming back to Harrier, but then the issue - all Harriers have a wide robust white rump patch easily seen from almost every angle. However, this one did not... The bird flew a short distance before landing out of sight in the sage. We discussed if it was worth flushing this bird again for an identification. In general we try to minimize our disturbance. However, this bird was notable enough and our identification was not positive enough that we decided we were justified to get one more look. "Normal" Northern Harrier with white rump patch. Roswell, Idaho. Neil and I exited the truck and started hiking through the sagebrush and grass landscape that makes up the NCA. The bird flushed again. Dang! My camera wouldn't focus... Then I got the shots! In all manner of flight style, shape, behavior, and habitat, this was a harrier. However, there was no white tail band... Do dark-morph harriers exist? None of us had ever seen or heard of one. This is clearly an unusual bird. According to various reports (see citations below) only three dark morph Northern Harriers have ever been reported and only one has ever been photographed (Liguori 2009). Dark morphs have been well documented in Northern Harrier's closest relatives, a number of other harrier species in Europe. This was a fantastic find and an exciting topic to explore. The photos are being shared with the top raptor experts in the country for their expert analysis. Neil returned to the area the next day but was unable to relocate the raptor. Liguori, J. 2009. Distant Raptors. Birding 41:74-76. Olson, C.V. and S.A.H. Osborn. 2000. First North American Record of a Melanistic Female Northern Harrier. Journal of Raptor Research 34:58-59. Bird geeks around the world recognize the 4 letters "NOGO" as the ornithology code for the Northern Goshawk. Most 4 letter codes consist of the first two letters of the first name followed by the first two letters of the last name as in NOGO for NOrthern GOshawk. Of course, it gets more complicated when two birds would result in the same code. For example, NOrthern SHoveler and NOrthern SHrike. In this case you just have to know that Northern Shoveler is NOSH and Northern Shrike is NSHR, but I degress. This story is about my mojo for finding Northern Goshawks on Christmas Bird Counts! While my sample size is quite small and would not pass statistical evaluation, I can say that I was 100% in finding NOGOs on the two Christmas Bird Counts that I worked on this year (If you don't know, the Northern Goshawk is the study species for my master's program in Raptor Biology at Boise State University). The Audubon Society has coordinated a count of wintering bird across North America known as the Christmas Bird Count (CBC). These counts use citizen volunteers to count birds in an organized fashion within per-determined 15 mile diameter "count circles". The counts have been performed each year for more than 100 years. The result is one of the most valuable datasets in ecological research. I participated in two counts this year, the Boise CBC centered on the Idaho state capital and the Bruneau CBC centered on CJ Strike reservoir. The counts are a great way to get out and see birds, learn from more experienced birders, meet new people, contribute to that ever important dataset and most importantly of all, contribute to the conservation of these miraculous flighted species. Great Horned Owl - 1 of 5 I counted on Bruneau Idaho CBC. The Boise Idaho CBC was held on December 18th. We met early in the morning to split up the territory into separate teams and then further split up the teams into sub-teams. Due to a previous commitment I was only able to volunteer for a half day. Karyn and I, along with another graduate student, Jessie, chose a hiking trail near my house which appeared to not be covered. The days was clear and sunny. The first part of our loop climbed through a small drainage rimmed with houses where adult and juvenile goshawks have recently been seen. As we walked up the hill, Jessie mentioned that she had never seen a goshawk in the wild. I responded, "like that adult flying up the canyon!" Awesome. The goshawk flew by at eye level before perching in a tree above a house. We were about 50 meters away as it launched off the perch, passed about 20 meters away and bombed toward some Mourning Doves. Unfortunately it came up empty. What a fantastic start to the day - summoning goshawks on demand!! Rough-legged Hawk. 1 of 3 I observed on Bruneau Idaho CBC. We continued our hike over the ridge and into the next drainage, where lo and behold, we would find another goshawk, this one a juvenile. These two would be the only goshawks counted during the Boise CBC. Great Horned Owls, Lesser Goldfinches, and a Hairy Woodpecker were other great finds. The three of us ended our half day with 23 species. The total for the Boise CBC effort included 48 volunteers recording 81 species. This was a great result, likely amplified by the great weather (it rained hard last year!). Next up, on January 2nd, was the Bruneau Idaho CBC. This event is hailed as one of the most fun in Idaho due to its scale. The count is centered on a large reservoir which in winter is home to a mind-boggling number of water birds. Have you ever wondered what 25,000 Mallards looks like? Thousands of Common Goldeneye? Simply amazing! I joined up with other Idaho Bird Observatory bird nerds Jay, Heidi, and Jessica, for a fantastic outing and a number of rare birds. Small portion of the 25,000 Mallards circling. First up was our portion of the reservoir. Yes, 25,000 mallards! Mixed in were Northern Pintails, American Wigeons, Red-breasted Mergansers, Common Mergansers, Canada Goose, Snow Goose, and Common Goldeneye. Twelve Bald Eagles stood on the ice watching the melee. As our presence was significantly annoying the local duck hunters we moved on into the woods. The reservoir is lined with Russian Olive groves. As we walked through the groves we found 3 Barn Owls, 3 Great Horned Owls, Ruby-crowned Kinglets, Yellow-rumped Warblers, Dark-eyed Juncos, California Quail, and an unbelievable number of Northern Flickers, etc. Next up we focused on the farming roads through the southern desert area. This wide open area is pocked with warm springs which attract unique birds. A local fish hatchery brought in the herons - 25 Great Blue Herons in the field next door. Two Loggerhead Shrikes graced our presence. They are much more rare this time of year than their relative, the Northern Shrike. The species list and the counts just kept growing. Loggerhead Shrike - Rare this time of year. A local hot spring ditch, very unremarkable looking, provided some of the best treats of the day. Two and maybe three Virginia Rails, Belted Kingfisher, Wilson's Snipe, Lincoln Sparrow, Spotted Towhee, and a Northern Mockingbird! Outstanding. The Lincolns and the Mockingbird are rare enough this time of year that ebird, the bird observation recording system, requires species documentation (as did the Shrike and a handful of other birds we logged!). Next up - Blackbirds and lots of them. Over 3000 in fact. The huge flock consisting of mostly Red-winged Blackbirds was moving between trees and a recently mowed cornfield. Mixed with the Red-wings were Yellow-headed Blackbirds(rare), Brewer's Blackbirds, Brown-headed Cowbirds(rare), and the not so rare European Starling. Watching the flock were a Cooper Hawk, a Prairie Falcon, a Red-tailed Hawk, and a Rough-legged Hawk. We watched as the Prairie Falcon stooped on the flock, but unfortunately came up empty. Yes, I usually root for the predator. I am an Raptor Biologist after all! We were too close to capture the whole scene in one shot. Portion of 3000+ flock of blackbirds. We finished our daylight hiking through more Russian Olives. Expectedly many of the same species were found and counted, but a few new ones were in this area. The raptors were out and hunting - Sharp-shinned Hawks, Coopers Hawks, American Kestrels, AND there in front of me was a juvenile Northern Goshawk! The mojo continued! My day was complete! Not to be outdone, Heidi found a Swamp Sparrow nearby. Unfortunately I did not get to see it. It would have been a lifer. Oh well. I guess I will have to keep birding! As the final light of the day faded I counted 1100 more blackbirds flying over in groups of 30-50 each. In the distance I could see the 25,000 Mallards taking flight as tens of thousands of Common Goldeneye returned to the reservoir for the night. Wow, Wow, Wow! Pretty cool stuff. The Bruneau count concludes with a meet up and summary at a local restaurant. The 30 or so volunteers took over the whole place. The staff fed us family style dinner and dessert. It was fantastic as we all shared our stories of adventure and rare birds. Our group of 4 checked in with 64 species. The preliminary total count included 91 species. My only life bird of the day was a Glaucous-winged Gull which was not in our count section but was still a great rare find. I will definitely be back for this count next year! The holiday season concluded a very busy year. In December I wrapped up my final exams and submitted the annual report for my research to the forest service. Both events were quite successful. Shortly thereafter my mother visited for five days. The primary activity filling our days involved bird watching. The first day I took her out roadside raptor banding. We caught, banded, and released four American Kestrels. A great combination of juvenile and adult, males and females. It was a great day. Unfortunately I was so caught up in the action that I failed to take any photos! The remaining days of my mother's visit involved visiting a number of the local birding hotspots. Below is a collection of some of my better photos from that week. Bald Eagle along Boise River. Song Sparrow already singing for Spring!